"Throughout the summer we enjoy the fudge sold on the boardwalk at the shore. Hubby and I came up with this recipe so that we would be able to enjoy our favorite flavor year round." Grease an 8x8-inch glass baking dish, and line with an 8x12-inch sheet of parchment paper. The ends will hang over the side of the dish. Melt the white chocolate, sweetened condensed milk, and butter in a microwave-safe glass or ceramic bowl in 30-second intervals, stirring after each melting, for 1 to 3 minutes (depending on your microwave). Do not overheat or chocolate will scorch. Stir in the maple flavored extract until just combined, then add the walnuts. Pour chocolate mixture into the prepared baking dish; refrigerate until set, about 1 hour. 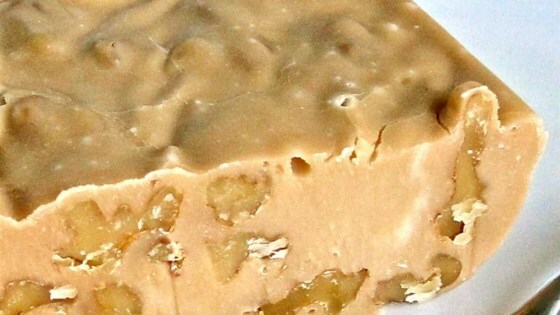 Remove fudge by lifting the parchment paper, then cut into squares. As all microwaves differ, the cooking time may vary. You just want to melt it on a medium power. I made these last Christmas before they became famous:) They rached instant fame in my house. I added some to the give away tins and everyone loved them, will make again this year.